The album title is indicative of the band’s sound on their latest release. Primal replicates the classic NWOBHM power first displayed over twenty years ago when Holocaust first stormed the scene with the likes of Blitzkrieg, Saxon, Diamond Head, and an up-and-coming Dickinson-less Iron Maiden! On this record, they haven’t just returned to their roots, they’ve uprooted the precept of another dated bands faded glory going through the motions for lack of middle-aged ambition. It’s been three years since their last The Courage To Be record and in the time, Holocaust, as with many of their era, have seen member ranks revolve at a volatile pace, often leaving one inspired original to engage the enemy of self-preservation with a cast of hired guns. Guitarist, vocalist and primary songwriter John Mortimer’s never sounded so intense as on these ten tracks, all pure Metal staples of the once lost generation and equally principled in today’s trying times. If there’s a thematic tie-in, it reverts back to the hostile environs of the individual’s struggle against the machine and surviving the storm of dissent hovering over the hopeful and still uncorrupt mind. While JM’s vocals are anything but Grammy-quality, envision an eerie combination of “Sirens”-era Jon Oliva, “Legacy”-era Chuck Billy and Primal Fear’s Rolf Scheepers; very “Primal” indeed. There’s little space for smooth deliveries or safe playing on this record, even for the slower moments where minor key choruses enter the realm to offer peaks of melodic transcendence within the overbearing four-plus bouts of nihilist grind. Accompanied by a band of new players that includes fellow Scot John McCullim on guitar, and stateside rhythmic duo, Ron Levine (drums) and Bryan Bartly (bass), the ideas, sound, production, and provocation for “Primal” are black leather and torn denim in every conceivable way. It’s a return to glory for a band whose “glory” survives, if minimally, by the number of covers done on their behalf by the likes of Six Feet Under, Gamma Ray and, yikes(!) The Meat Puppets. And then there’s some group going by the name Metallica that’s popularized “The Small Hours” classic in the “Garage” and on the stage. Discontented to let others do their dirty work, Primal powers past anything they’ve produced since their monstrous ’81 debut, The Nightcomers. With a sloth-like and lurking overtone, the sound is on the darker side of the Metal extreme, converging powerful riffing with open chording and uplifting verses, giving duo fold recall and response purpose to tracks like the bludgeoning opener, “Iron Will,” the thrashier “Black Box” and “Fools (Bring On The Light)” and “Hell On Earth” with its “resistance, persistence” persona. Momentum drags toward the end on the notably slower “Colossus” and “Lost Horizons,” more typical of the folksier, melodiously-driven works of “Spirits Fly” or “Courage…” still, there’s no escaping the crude production to lend the old world charm to close the latest chapter. Always in a seeming period of transition, this latest installment of Holocaust could prove to be their strongest yet. 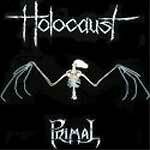 The band is fresh, the sound is heavy, melodic, and endearingly sloppy on occasion, the style is unapologetic… and Primal is significant of a traditional-minded Holocaust’s rebirth in delivering on the promise of their past to successfully surpass second place Small Hours status with a new age of Heavy Metal Mania!